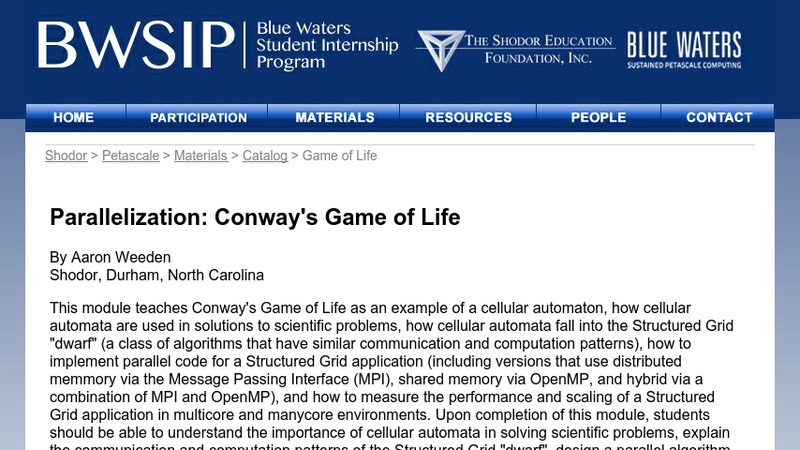 This module teaches: 1) Conway's Game of Life as an example of a cellular automaton, 2) how cellular automata are used in solutions to scientific problems, 3) how to implement parallel code for Conway's Game of Life (including versions that use shared memory via OpenMP, distributed memory via the Message Passing Interface (MPI), and hybrid via a combination of OpenMP and MPI), 4) how to measure the performance and scaling of a parallel application in multicore and manycore environments, and 5) how cellular automata fall into the Structured Grid "dwarf" (a class of algorithms that have similar communication and computation patterns). Upon completion of this module, students should be able to: 1) Understand the importance of cellular automata in modeling scientific problems, 2) Design a parallel algorithm and implement it using OpenMP and/or MPI, 3) Measure the scalability of a parallel code over multiple or many cores, and 4) Explain the communication and computation patterns of the Structured Grid dwarf. It is assumed that students will have prerequisite experience with C or Fortran 90, *nix systems, and modular arithmetic.